Day 08 Drive to Shigatse, afternoon visit Tashilumpo Monastery. Upon arrival at Tribhuvan International Airport (TIA) in Kathmandu, you will be received by our representative and transferred to your Hotel. If arrive early mid-day is free to venture around the city close to your hotel. Briefing at the hotel in the evening. Ater breakfast, we will have a full day guided cultural tour to three of the famous UNESCO heritage sites in Kathmandu. 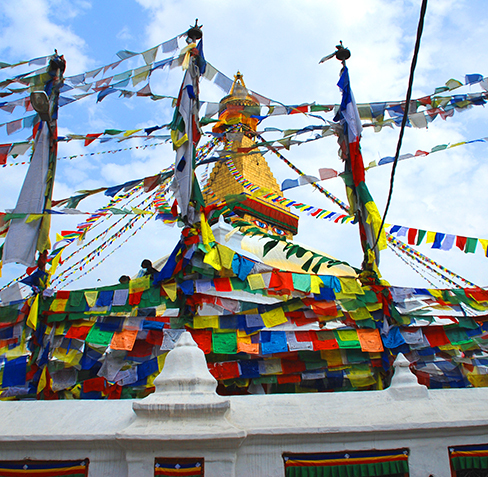 We will first visit; the stupa of Swayambhunath (Moneky Temple),the Buddhist shrine is considered to be over 2000 years. Followed by beautifully designed ancient city Patan, Once, an independent and mighty kingdom of the Kathmandu Valley and lastly Pashupatinath, a sacred Hindu temple located on the banks of Bagmati River also considered the holiest cremation ground for Hindus. Starting our marvelous journey with an overland drive towards North West of Kathmandu past farm villages and towns with grand views of snowcapped peaks and then reaching at cooler areas within Langtang Himal in Dhunche 1,900 m high, a main and headquarter town of Rasuwa district around Langtang area, populated by Tamang people the hill tribe of Nepal. From here downhill for two hours with overnight at Syabrubesi, the door to Langtang, Ganesh and into Tamang Heritage Trail and as well to Tibet border. From Syabrubesi morning drive on newly built road linking Nepal / Tibet border to Rasuwagadhi (1800m / 15 km / 1 hr min from Syabrubesi), here received by our Tibetan counterpart guide and drivers, after completing immigration & custom formalities on both side of the frontier Nepal / Tibet at Rasuwagadhi, continue drive further to Kerung county with first overnight stop in Tibet accommodation at local guest-house. At Kerung afternoon with time to relax and enjoy views of Ganesh and Langtang Himal that borders Nepal and Tibet. Kerung is also a famous religious and historical place, home of 11th Centaury great saint and Guru Milarepa known for his tantric wisdom as well a poet and folk singer, his song are still remembered by local herdsman and villagers. From Kerung onward where Tibetan high plateau begins as morning drive leads past Tibetan farm villages to reach on top of Lalung-la Pass (5,050m) with views of Mt. 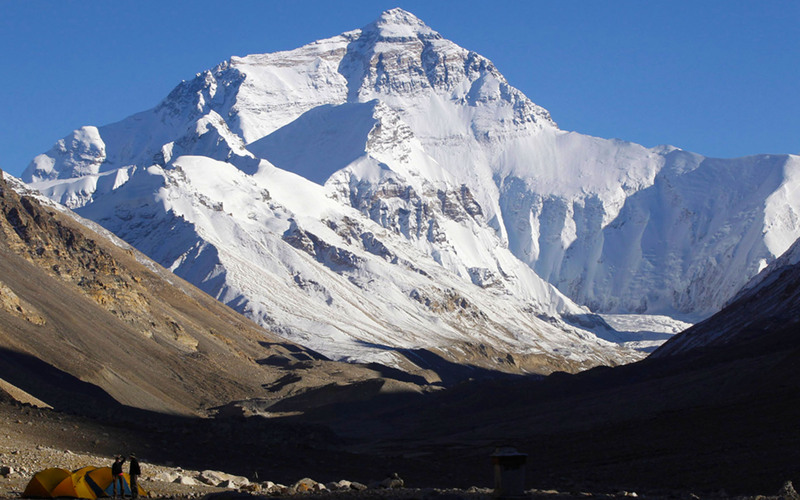 Shisapangma (8013m highest within Tibet). After Lalung-la drive leads on vast Tibetan plateau with high and dry terrain to Old Tingri with first glimpse of Everest and Cho-Oyo peaks, from here few hour drive to Shegar also known as New Tingri and then transfer to your hotel or lodge for overnight stop. From New Tingri and Shegar (Xegar) our route diverts away from main highway towards North Everest base camp and Rongbuk area. As drive leads over scenic Pang-la pass at 5,200 m high offering super panorama of world highest peaks including Mt. Everest, Makalu, Cho-Oyu and adjoining peaks, from here descend to Tashi Dzong village to reach Rongbuk Monastery and its many smaller hermitage caves. This holy and remote sacred spot first introduced to the world in 1920’s by 1st British expedition teams of George and Irving Mallory as well a famous novel by James Hilton ‘Lost Horizon’. At present most of retreat cells are abandoned with only few small shrines scattered at end of the valley. According to Rimpoche (high priest) of Rongbuk, this monastery was first built as a religious place past 250 to 350 years ago. After a time in Rongbuk with overnight stop, take a local taxi or horse cart to reach at Everest North Base Camp, or one can walk taking 3-4 hours both ways. To save time better on horse cart or motorbikes serving as local taxi takes about 45 mins to an hour to Everest Base Camp at an altitude of 5,200 m high, rewards you with super full views of Mt. Everest with other adjoining peaks and Rongbuk glaciers. Everest in Tibet known by the name Chomolungma means ‘Great Mother’ after a wonderful time at base camp return back to Rongbuk Monastery, and then continue drive on the same route to Shegar. From Shegar drive leads over highest pass of the journey at Gyatchu-La at 5,220 m high festooned with thousand of Buddhist prayer flags and religious offering, with time here heading downhill on winding road to reach at Larze town for overnight stop. Larze a growing town located on Nepal-Tibet / China Friendship Highway as well on the road to holy Mt. 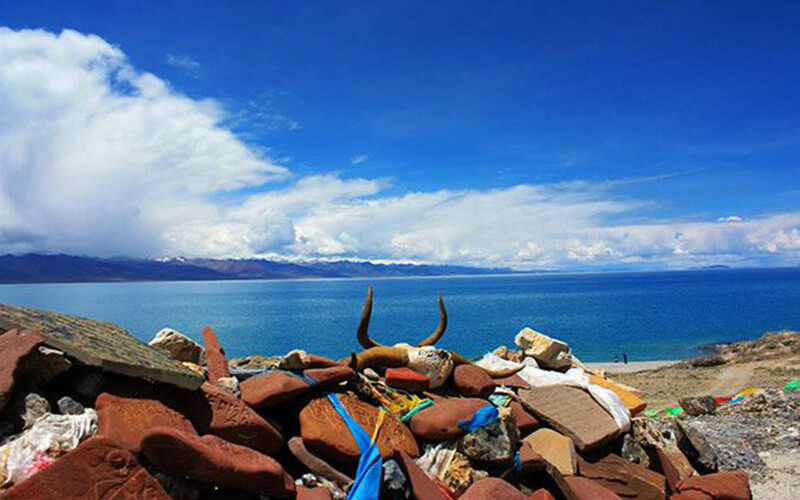 Kailash and Lake Manasarover towards Tibet’s Far South West, which is near to Sakya Monastery and towards our destination at Shigatse. Day 08Drive to Shigatse, afternoon visit Tashilumpo Monastery. From Larze town, morning drive is short of few hours on good road to reach at Tibet’s second largest city in Shigatse drive continues past rural farm villages and well tended fields of barley-wheat and yellow mustard. After an enjoyable ride reaching at Shigatse where hotels are much better than past few night stops, in Shigatse transfer to excellent hotels with modern facilities of Wi Fi and money change at its exchange counters. Having lunch getting refreshed a short drive in the hub of Shigatse for marvelous tour of famous Tashilumpo Monastery complex adorned with Golden Roofs here visit the monastery interior of great interest with tomb stupa of several late and past Panchen Lama. With enjoyable tour of the monastery and the seat of Panchen Lama visit the local colorful Tibetan market and return back to hotel. Morning getting refreshed with breakfast, continue drive towards eastward for few hours to reach at Gyantse another large city of Tibet, where in early 19th and 20th century was a flourishing place where trade between Nepal-Bhutan and Sikkim used to take place. 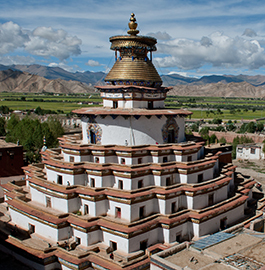 On reaching at Gyantse transfer to another nice hotels or guest house with afternoon tour of old Phalkor Monastery and great terracotta Stupa of Kumbum, famous historical monuments located within great surrounding walls of this holy complex. Morning our drive leads to our next highlight of the journey heading towards the fabled city Lhasa, drive leads past Simi-La pass within great Tibetan plateau where you can watch Yaks and other cattle grazing on huge green meadows. As the ride progress heading towards a scenic Karo-La pass of above 5,050 m with close views of Nzongkhangsa peaks at 7,100 m high where ice falls and glaciers flows near to the road head. Here enjoy the views as well observe the traditional life of Drokpa (Nomads) and Yak herder then reaching Nagarktse town and beyond towards beautiful turquoise Lake of Yamdrok Tsho then on high hills to reach another scenic Khamba-La pass at 4,800 m high. 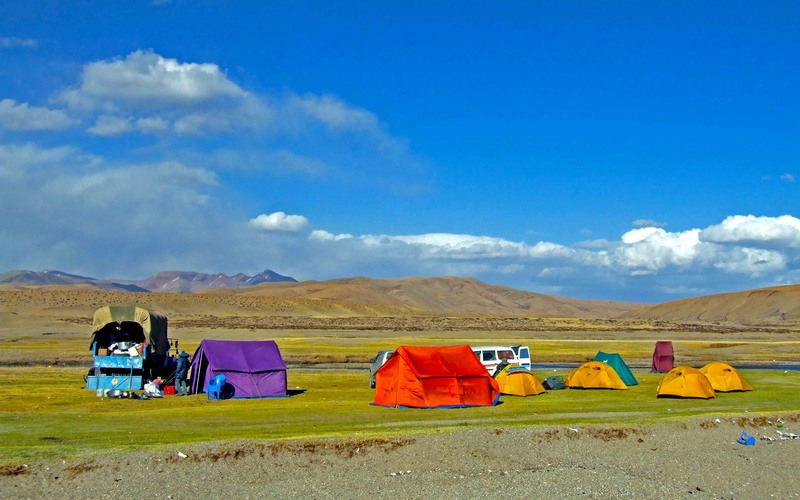 Khamba-La offers super panorama of Tibetan tableland and landscapes with distant views of snowcapped peaks and of Yamdrok Tsho Lake. 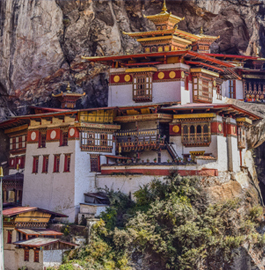 From here after marveling the scenery heading downhill to come across a bridge over Yarlung Tsangpo / Brahmaputra River, slowly our overland journey reaches in the heart of Lhasa city in the backdrop of magnificent Potala Palace. At Lhasa our hotels located on the old part of Lhasa within east areas near colorful and exciting Barkhor Square and its markets. These two days engrossed with ever exciting tour around Lhasa important places of immense interest within its historical and religious sites, beginning with short drive west of Lhasa towards a hill top with tour of old Drefung Monastery, in the early day home of all high priest and Dalia Lamas before Potala Palace was built. Here visit the main prayer halls with monks on deep prayers where Drefung means a heap of rice with its white washed buildings as it looks from distance views, after a great interesting visit drive to Shera Monastery where you can witness young monks on exciting debate, which deepens their knowledge of all types to reach their priesthood. Shera monastery located north of Lhasa after an interesting time with lunch break in local Tibetan / Chinese restaurants, afternoon tour of magnificent Potala Palace known as ‘Heavenly Realm’ with 1,000 rooms where visitors can tour only the main important interior of 8 to 10 rooms of great significant. Potala Palace stands as Landmark of Tibet situated in the hub of the city, where high and superior priests Dalai Lama lived till the last 14th Dalai Lama, at present turn into a museum. After a grand tour head back into busy and colorful Barkhor Market Square with time to visit Jhorkhang Temple, the oldest religious sites of Tibet. As the day end in Lhasa, with time for individual activities around Lhasa before dinner time on last day in Lhasa. Morning as per the given time by our Tibetan guide, depart from the hotel for an hour drive which leads outskirt of Lhasa city area and then on the nice newly built highway entering few wonderful tunnels to reach Gongar airport. Here bidding farewell to our Tibetan guides and ever smiling friendly drivers entering the terminal for visa and passport formalities with a custom check. Board in Air China for super panoramic flight of over an hour to Kathmandu during airborne breathtaking views of the Himalayan chain of peaks with close views of Mt. Everest and Mt. Makalu as the flight finally lands at Kathmandu Tribhuvan International Airport. Hereafter migration and visa formalities heads outside the terminal, where our staff transfer you back into your hotel, with much time in the afternoon for individual activities and shopping. Our adventure in Nepal & Tibet comes to an end today! After Breakfast, Free till departure transfer to the airport to connect with the onward flight. Return home to tell the tale of legendary adventure. Every effort will be made to keep to the above itinerary; however, since this adventure entails travelling in remote mountainous regions, we cannot guarantee that we will not deviate from it. Weather conditions, health condition of a group member, unexpected natural disasters, etc., can all contribute to changes in the itinerary. The guide will try to ensure that the trip runs according to plan, but please be prepared to be flexible if required. 01: All arrival and departure transportation airport / hotel / airport in Nepal and Tibet. 03: In Kathmandu includes accommodation with Bed and Breakfast basis only. 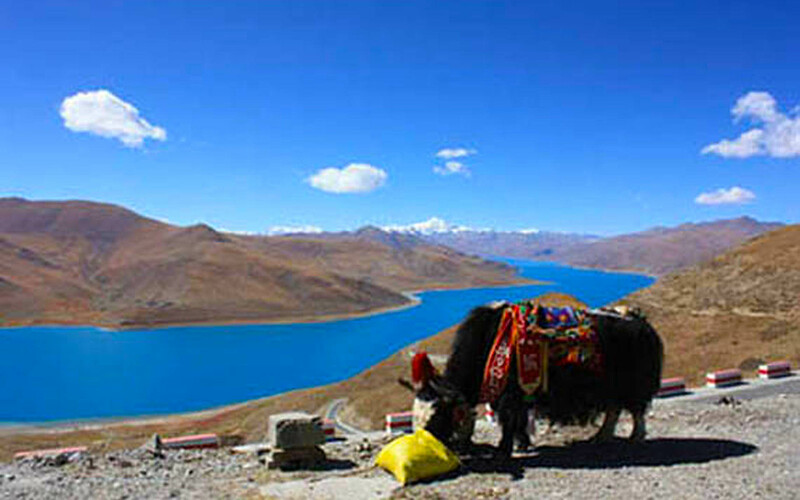 04: In Tibet on full board includes B-L and Dinner with accommodation. 05: Sightseeing tour as per the itinerary with entrance fees where applicable. 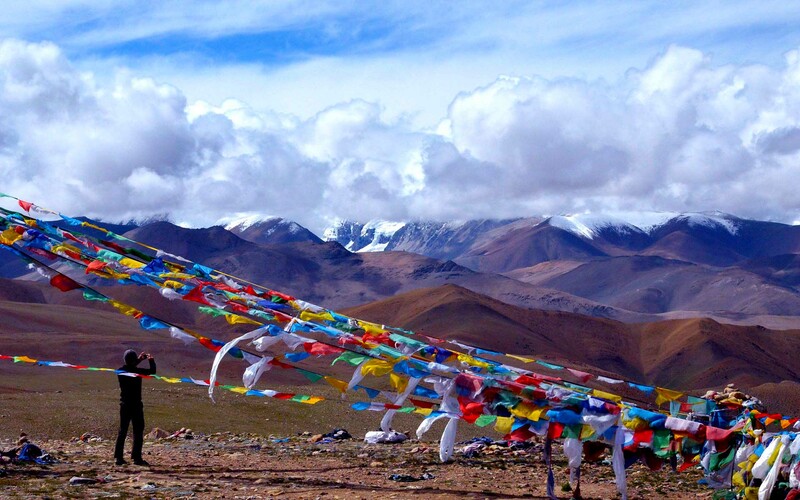 06: Applicable Tibet Permit & Tibet Entry Visa Fees. 08: Comprehensive medical kits and re-confirmation of international air tickets. 10: Airfare as per the itinerary Kathmandu / Lhasa /Kathmandu. 01: Nepal Visa-International airfare-personal travel and medical insurance. 03: Personal gear and medical kit.